The wide, wet clouds far overhead like the surface of the sea from the ocean floor. 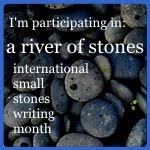 I’m participating in the River of Stones project in January. Look for a new post each day. Click the badge at left for more details.